Why isn’t my podcast episode appearing in iTunes/my playlist widget/a directory? If you've published a clip and it's not appearing where it's meant to, check here first. Click on the playlist, then click “Upload to Playlist” in the top right-hand corner. You can also drag and drop audio files into the playlist. Set rules to automatically add episodes to the playlist. 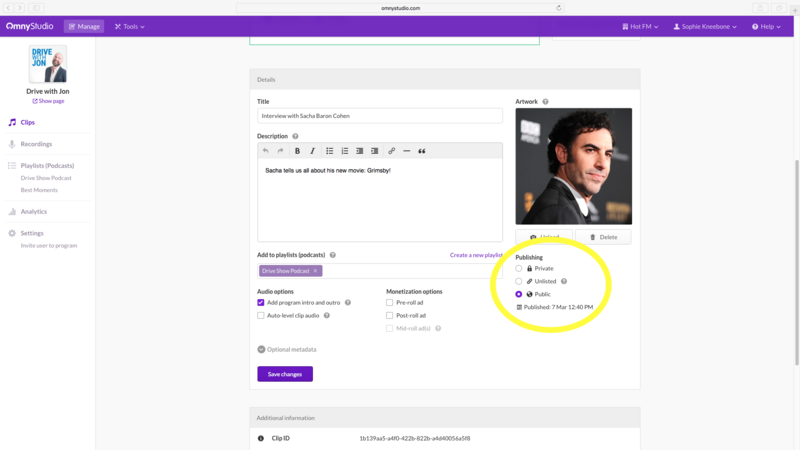 This way, if you upload an episode to the Clips section of Omny Studio and it matches a rule you’ve set up, it will automatically add to the right playlist. Set up rules by going into the playlist and clicking “Auto add clips”. Add clips to a playlist from the clip library or the upload screen. You can also add clips to a playlist after they’ve been uploaded to the clip library by clicking “Add clips from library” in the playlist screen. Clips in Omny Studio have three different visibility settings: Public, Private and Unlisted. Public means the clip is publicly viewable, indexed and can be shared or embedded on a website. Private means the clip is only able to be viewed by users with access to your Omny Studio account. Unlisted means the clip is not publicly viewable, but can be shared via the Omny.FM link, embedded in a website, or linked directly to the MP3. If your clip is set to "Private", it will not appear in Apple Podcasts or other podcast directories. To change a clip's privacy setting, click on the clip and scroll down to the section marked "Publishing". If you have more than 100 episodes in your playlist, older episodes may no longer appear in the RSS feed. 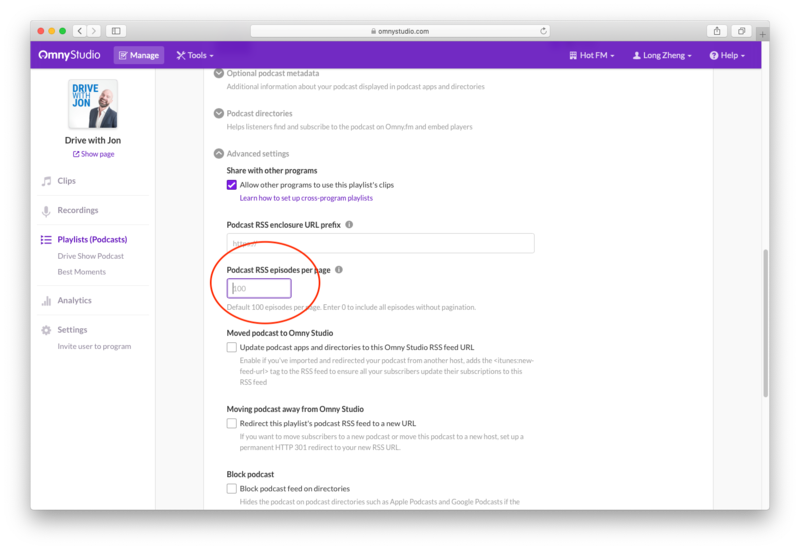 By default, the playlist RSS feeds are limited to showing the most recent 100 episodes to optimize for performance. Note: the RSS feeds provide additional pages to see older content, most podcast apps like Apple Podcasts do not support pagination so will only show the number of results on the first page. 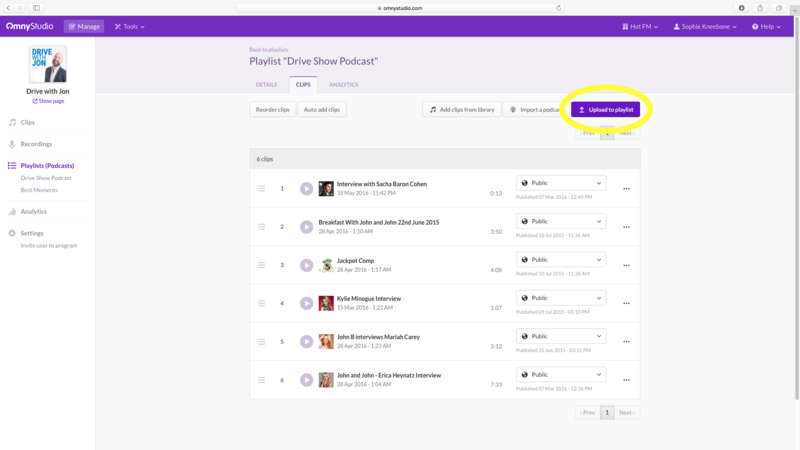 You can change the number of episodes shown by adjusting the "Podcast RSS episodes per page" under "Advanced settings" in the playlist details page.